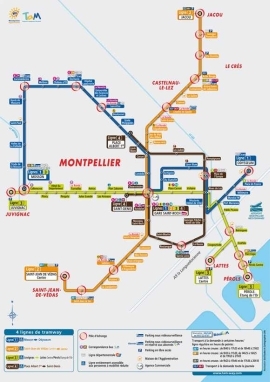 The first tramway was built in Montpellier over 140 years ago and today there are about 60km of tramlines criss-crossing the region's capital. This April saw the inauguration of two new lines, six months ahead of schedule, to cope with the growing number of passengers - an extra 15 million each year ! Officials say this has provided much local employment and helped reduce traffic congestion. The aim is that by 2020 cars will be reduced by 10% and emissions by 23%. The mayor of Montpellier has often been praised for his foresight and careful investment in this beautiful City. The four lines are estimated to carry 282,000 passengers a day, and each has its own livery and identity. In 2000 Line 1 was opened with its blue trains and swallows symbolising 'air' and Line 2 in 2006 opened with its 'flower power' design symbolising 'earth'. Line 3 has been decorated with magical sea monsters and fish symbolising 'water'. Strange then that for Line 4 they didn't opt for the obvious 'fire' (although it is yellow and gold) but instead its design has been inspired by the engravings of the 17th Century. Ideas and plans for Lines 5 and 6 are already in the melting pot. The tram timetable starts at around 4.30 in the morning and finishes around half past midnight, running regularly between every 4 and 10 minutes depending on the time of day. A one way ticket costs 1.40€ and a return 2.50€. 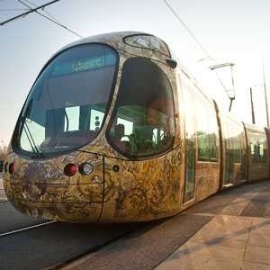 It is possible to park free on the outskirts of the City and take a tram into the centre which is not only more economical; it's a lot of fun too. A day pass is also available for 3.80€. Full timetable, information on routes and parking are to be found on the website.